John o' Groats to Land's End in a manner befitting the current financial downturn, i.e. as cheaply as possible. Time away from our respective employers and offices meant that a caveat was additionally placed upon our strapline: speed. Consequently, the LEYTR Top 'n' Tail jaunt would be done as cheaply and as quickly as possible. 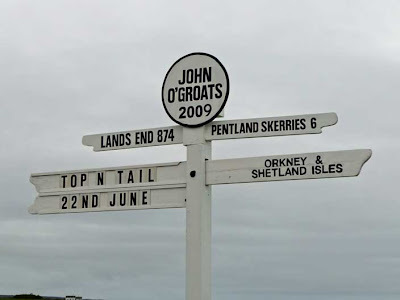 One thing that specifically struck me about other people's John o' Groats to Land's End trips is that virtually all that have been written up only tell half the story. The publicised 874 mile trip forms only one part of a round-robin journey from the valiant traveller's home. He, she or they need to first get to whichever extremity they're to commence from and to then return home from its counterpart location. Our trip aims to cover all of this - with the to/from journeys being made in the same spirit as the main leg, i.e. as quickly and as cheaply as possible. And so it was that I found myself at a friend's house in Lincoln. I'd travelled there the evening before so that both he and I could be correctly positioned for the day's initial journey, a trip to Scunthorpe by bus: a brand-new Scania/Enviro400 operated by Stagecoach in Lincolnshire to be precise. Service 100 only commenced operation in May 2006 and yet last month the hourly frequency outgrew the Alexander ALX300-bodied MANs that had been operating the route, being replaced with these new Enviro400s. The route forms part of Lincolnshire County Council's InterConnect network of services, which incidentally celebrates its 10th anniversary this year. Brand-new Scania/Enviro400 seen in Scunthorpe, having worked the second northbound journey of the day. We boarded 15507 (FX09 CZW) in Lincoln's City bus station, which formed the 0835 journey to Scunthorpe via Gainsborough. The Enviro400 body, while looking stylish and progressive from the outside, does not have an interior that emulates the same in my opinion. There's far too much rattling and banging for my liking - to think the bus is merely weeks old, too!! The ride comfort is okay though and the special InterConnect livery Stagecoach is starting to apply to its vehicles operating InterConnect services looks very striking (even if it does resemble a Cadbury's Cream Egg wrapper)! 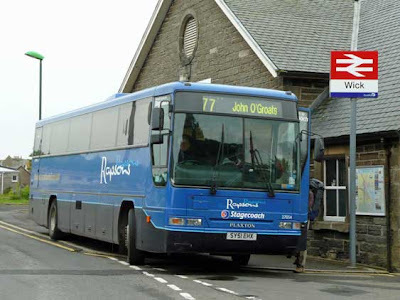 The route is operated by Stagecoach's Gainsborough depot. Unlike Scunthorpe and Lincoln depots, Gainsborough has a few services that conform to the EC Drivers' Hours Regulation and so it made operational sense to take-back all diagrams in readiness for the new vehicles arriving (Lincoln depot did operate one diagram on the service). We kept to time throughout on this relatively quiet Saturday morning and despite the sunny weather at all times, alighted in Scunthorpe to a heavy downpour. 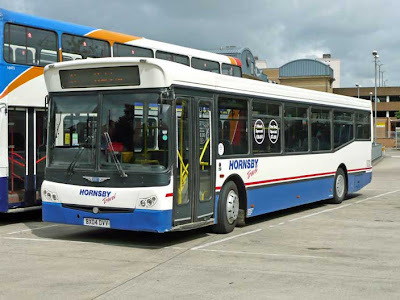 While Stagecoach may be the dominant operator in Scunthorpe, small independant Hornsby can still be seen in the town, now operating four main service, some of which jointly with Stagecoach. Our next service was another operated by Stagecoach - their recently improved Service 350, linking Scunthorpe-Barton on Humber-Hull and re-branded FastCat. The service had been hourly with East Yorkshire operating one of the three diagrams. 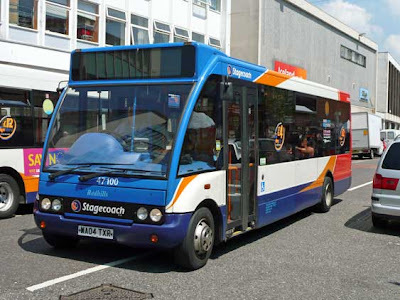 Now, Stagecoach believe that patronage was such that it would double the frequency to half-hourly, though East Yorkshire did not increase their diagram, continuing to operate one vehicle (of the 6 now deployed) to similar timings as before. 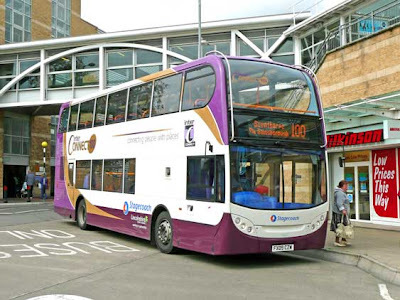 Stagecoach purchased some new MAN/Enviro300s and an agreed brand and livery was adopted. At the end of March, the FastCat was born. The Humber FastCat can easily be spotted here. There are many references to cats in the branding and advertising. The livery is pretty awful - sentiments we understand that are shared by Les Warneford, Stagecoach Bus MD, but you certainly can't argue that the bright orange livery with grey claw marks is striking. East Yorkshire has offered a dedicated vehicle to the route, a Volvo B7RLE/Wrightbus Eclipse Urban, and it too is painted in the orange FastCat livery. Unlike the old 350 timetable, it is now impossible to know which journeys are operated by each operator. 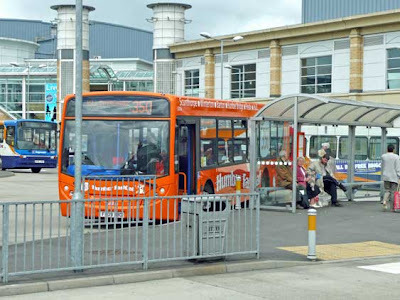 Stagecoach's Hull depot now also operates journeys on the service, being allocated two diagrams. This has never occurred before, with Service 350 historically being a RoadCar service. 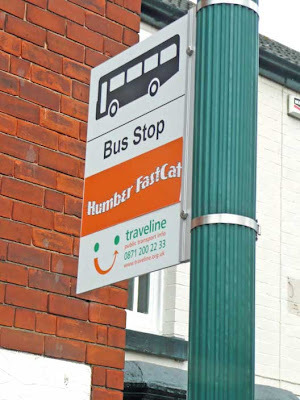 Stagecoach, EYMS and North Lincolnshire Council have joined forces to ensure publicity is visible at all stops. Every single bus stop flag along the route (even those at far-flung rural outposts) have FastCat-branded flags. The old departure time was xx10 from Scunthorpe, with the new half-hourly departures at xx15 and xx45. We caught the 1145 and were pleasantly surprised at how quiet it was. A Saturday in Scunthorpe bus station isn't always the most enjoyable place to be, and with Hull being such a pull for youngsters in the area, I had prepared myself for a chav-fest aboard the bus. It was not to be. I suspect, though, that the xx15 departures past each hour would be busier on account of people not liking change and preferring to catch the journey most similar to that which operated before. We wound our way along the A1077, diverting via Winterton and Wintringham until Barton on Humber. After passing through the town's market place, we called at the rail interchange. A Class 153 operates two-hourly from here to Cleethorpes via the Barton Line and Service 350's timings in both directions coincided with the arrival and departure times of the train. Now they do not. 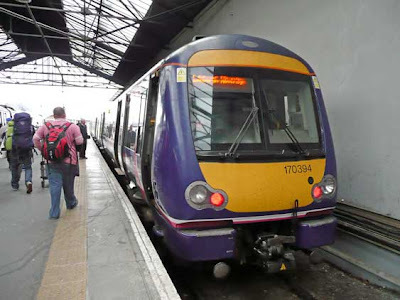 We understand, though, that a much greater connection time has been welcomed by the Friends of the Barton Line who believe that the old connection time (5 minutes) was too tight. From here it was over the world's one-time longest single-span suspension bridge into the East Riding of Yorkshire (but not for long) before entering Hull. This is the 'view' passengers have as they cross the second longest single-span suspension bridge in the world - the underside of the FastCat's contravision claw all over the window. Stagecoach successfully bent the Humber Bridge Board's (HBB) arm into offering a discount to PCVs operating stage-carriage services across the Bridge. They did so only by threatening to completely withdraw the only direct service linking Grimsby and Hull though. 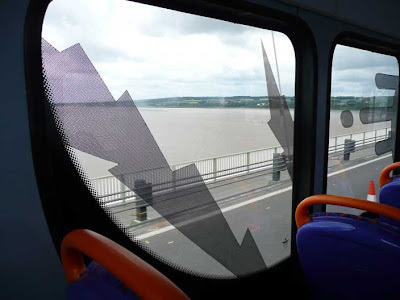 There was much uncertainty for regular passengers on both sides of the Humber for many months until, eventually, a breakthrough was made in 2007. Very few operators object to paying a fee to cross the Humber Bridge, but most are angered at the difference in price a bus is made to pay over a car. Currently cars pay £2.70 and PCVs pay £10.60. We understand numerous operators wouldn't regularly object to the toll increase (forcing a public inquiry each time - at great cost to the HBB) if the fee a PCV paid was, at most, double that paid by a car. On other bridges throughout the UK, this is very often the case. From Hull we sampled our first-ever trip aboard a Megabus vehicle from the city. A full write-up of this journey will appear in another media sometime soon. Once in London, we visited the Montagu Pike Wetherspoons pub in Soho (two 2-course meals and drinks for under £20 in zone 1!) before taking a steady walk to Victoria train station where we would meet the third and final member of our trio. Once convened, we headed to the coach station for the 2300 Service 588 to Inverness. 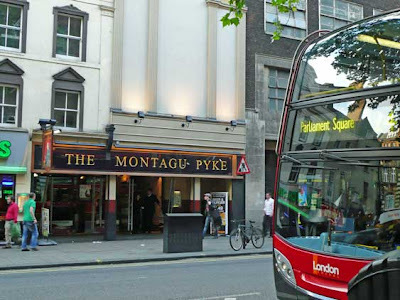 Both m'colleague and I are big fans of Wetherspoons - here's one of the cheapest places to eat in central London, the Montagu Pike. This hostelry also acted as my local for a couple of years. 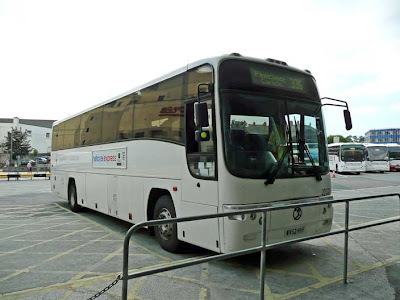 National Express officially measure this route to be 581.4 miles in length and it therefore makes it their second-longest coach service in the UK. With the equivalent journey by train equating to more than double the on-the-day fare NX offer (ironically it's NX who also calculate the train fare, too! ), it fitted well within our remit. Bruce's Coaches operate the service now, taking over from Rapsons not long after Stagecoach purchased the group. Rapsons used 04-reg Volvo B12Ms with Jonckheere bodies; Bruces prefer VDL/Bovas, though on our journey a tri-axle Scania/Levante was working, with its rear-end adorned in a contravision blue cross, signifying the Scottish flag. Bruce's Coaches' tri-axle Scania/Levante C53Ft - very comfortable thanks to the additional leg room. The coach is seen here at Keele Services, the first of two short stops en route to Inverness. Normally, NX's tri-axle Levantes have 61 seats (the twin-axle versions have the standard 49 seats), though we were very impressed to see that Bruce's versions have only 53 seats yet measure 14.2m in length. Consequently, the leg room was very good indeed. We all commented well into the journey just how much difference a little more space makes a lengthy journey like this. We had two drivers who would between them take us to just beyond Glasgow, by which time it would be Sunday morning. Both work part-time for Bruces and one was ex. Stagecoach, implying he'd driven the service before, to which we understood to mean during Rapsons days. One even though he recognised yours truly. We had a brief discussion about whether this was fame or infamy. We never did get an answer! At precisely 2300, FJ58 AKK departed. We had no one to board at Golders Green so headed off up the A41, by-passing Brent Cross, to the M1. Day 2 dawned for us somewhere along the M1, as we headed north to the temporary coach stop near Milton Keynes, at which all National Express coach services are calling while their dedicated Coachway undergoes refurbishment. Timings aboard Service 588 seemed a little tight: we left VCS punctually and didn't stop once until Milton Keynes and yet were 5 minutes late! From here we progressed north, leaving the M1 for the M6 and had our first break of the journey at Keele Services just after 2am. 30 minutes later we departed, and followed the M6 through Greater Manchester and Lancashire to our first official stop since Milkton Keynes: Penrith. We were a minute or two late here but it didn't seem to phase our drivers. We didn't stop then until Glasgow, where we were timed to arrive at 0715 and depart fifteen minutes later. In actual fact, we both arrived and departed at 0730. Megabus give a straight 8 hours travelling time on its direct, overnight London-Glasgow services; NX offer 30 minutes more and yet call via Golders Green, Penrith and Lockerbie. 11.33am at Inverness bus station. Our driver unloads everyone's luggage in glorious sunshine. As we were leaving Glasgow, one of our driving duo alighted with his overnight bag; we presumed he lived nearby and would walk the rest of the way home. Our second driver took us about 10 miles up the road towards Stirling before pulling off the motorway and onto a bridge to swap drivers with a chap who'd come from the Bruce's depot by red van. We continued northbound, passing through Stirling and Perth and onto the picturesque section of the A9 towards Inverness. By now there were only 10 people on the coach and we all reflected on what an enjoyable journey it had been. There had been no problems with any of the passengers, the drivers had been great, their announcements pretty good, the coach comfort very impressive and the spaciousness resultant in the additional leg room was terrific. Fares appear to start at £22 single if booked online and while Megabus offers some of its seats for £1, they're incredibly difficult to find on its equivalent services - plus a change of coach at Edinburgh is required, the leg room is worse and you never know what type of vehicle is going to transport you over 500 miles. 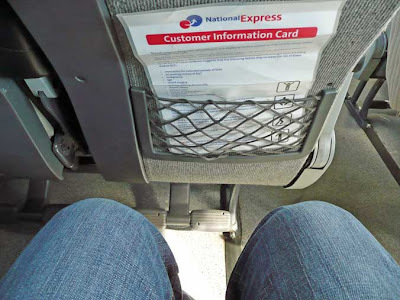 The additional leg room that passengers aboard NX's Anglo-Scottish Scania/Levantes have. Very nice. 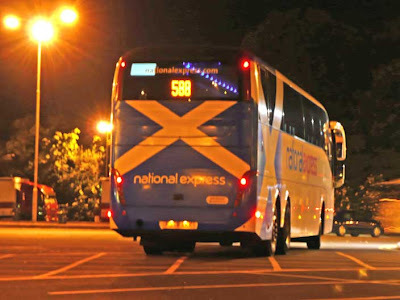 We all agreed that National Express definitely still have the edge on Anglo-Scottish coach journeys, especially those taking place overnight. Would they operate them the way they now do had Megabus not come along as a wake-up call? That's another question! We arrived in Inverness 2 minutes early at 1133 and after some nice shots of our home for the past 12.5 hours, we headed to the city's Wetherspoons. From within, we devoured three very large all-day breakfasts and quaffed a fair amount of liquid. It was soon time to let it all settle while we travelled for a relatively short 3:15 journey to Wick, curtest of Stagecoach' Service X99. I've travelled aboard this new-ish service on three occasions now and have noted alterations to its operation since last November. 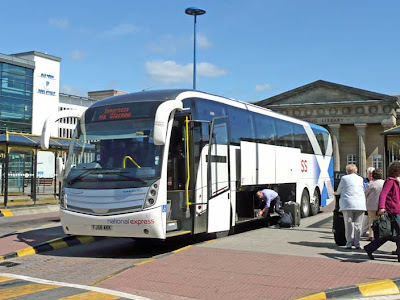 Initially, brand-new Volvo B7Rs were used, though due to there being no toilets on board (an end-to-end Thurso-Inverness journey is around 4 hours), they were replaced with ageing Scottish Citylink-liveried Volvo B10Ms. 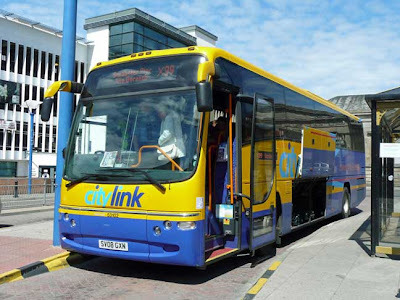 Today's 1415 departure was formed by a Scottish Citylink-liveried Volvo B12B/Plaxton Paragon. Equipped with climate control, 53102 (SV08 GXN) was a much welcome sight. Very similar to our 2005 Railrover, the temperature was starting to rise and, despite heading to the Far North, there's nothing worse than sitting in your own juices aboard a badly ventilated coach. Off we go again: time for a 3:15 journey to Wick aboard this Stagecoach in Caithness (Thurso depot) vehicle - not that you'd know it from the livery of another operator it displays. Our service was the only one on a Sunday that extends to Scrabster, where passengers can catch a ferry to the Orkneys and Shetland. I was pretty sure that the 35 passengers on board weren't all going to the very end, with a few alighting en route, and around 25 remaining as we approached Wick. The X99 has been re-numbered since the summer timetable was introduced last month. Initially numbered 25X, this service now only operates 'shorts' to Tain; the extensions northbound are all numbered X99, probably to distinguish the journeys better. On a Sunday, the X99/25X timetable is a seven-vehicle working, with Thurso providing 3 coaches and Tain depot 4. Ours was a Thurso working. The route between Inverness and Wick is completely different by road to that by rail. The road (A9) stays close to the coast, whereas the railway meanders inland for much for the furthest section north. 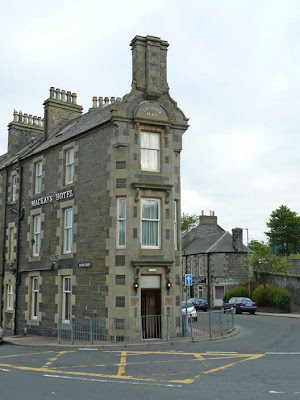 We arrived in Wick punctually and made our way to our overnight accommodation. By sheer fluke, we'd booked to be in the second-most northerly town on the mainland on the longest day of the year. Tonight's official lighting-up time, according to a local Wick paper, was 2223. In actual fact, we staggered home from the country's most northerly Wetherspoons (I've made many a visit to The Alexander Bain in the past couple of years) at 2300hrs and it wasn't what you'd call especially dark then! Tomorrow though, Day 3, would see this merry prelude end and the main journey commence: John o' Groats to Land's End in 31 hours and 5 minutes, being undertaking as quickly and as cheaply as possible by public transport. There's nothing worse than having to get up with the milkmen at silly o' clock in the morning to start an historic trip! Our first bus of the day was thankfully at a reasonable hour - 0845hrs, from Wick rail station, taking us to John o' Groats. In the past 4 years, I've made this specific journey on three occasions and each time the journey has thrown up something interesting. The first time, back when m'colleague and I undertook our 2005 LEYTR Railrover, the chap driving Rapsons' Service 77A mis-charged us the fare for their Rover ticket and we saved a couple of quid; the second time in Febraury, my friend and I travelled aboard a full-sized coach with National Express trim and a huge hole in the back where the toilet and servery used to be. On this occasion, our driver was from Kent and spent 27 years living in Scunthorpe - in the heart of the LEYTR area! Our first vehicle of the day: Stagecoach in Caithness Service 77, seen here parked outside Wick rail station. It was quite a revelation - so too was the Kent stuff, since one of we intrepid three lives there, too. Our vehicle was a full-sized coach again - a Dennis Javelin/Plaxton Profile, 27054 (SY51 EHX), still wearing the overall dark blue Rapsons livery and bearing both Rapsons and Stagecoach fleetnames. It featured 2+3 seating (C70F) and had just come off a school run. The driver of Service 77 (on this occasion we caught the slightly more direct journey, compared to the once-daily Service 77A) was based at Thurso and explained how recently, in a bit to improve the frequency of various services in Caithness, Stagecoach had allocated a large amount of what was traditionally operated Wick depot work to Thurso, which sees a lot of empty running in the mornings and evenings. The only 'person' that paid on the journey was a tray containing 10 loaves of bread. This was put onto the bus at the Somerfield stop in Wick, with the baker paying the bread's fare with instruction to drop the haul off at the John o' Groats Post Office on his way back. Everyone else travelled free. We arrived at John o' Groats bus terminal in light drizzle on time at 0940. En route, the driver's offside windscreen wiper stopped working, but with a small amount of manual adjustment, he set it right. 2+3 seating really is awful for any journey carrying people over 5-feet tall. Having wandered around the tourist areas located nearby, and having had our photo taken under the historic sign post on top of a concrete plinth, we went to board our next vehicle - the first of this historic trip. "Surely you want 'LEYTR' on the sign?" said the guy taking the photo. That would be going just too far - "The working title of the jaunt will be sufficient," said we! This was the 1025hrs Stagecoach in Caithness Service 80 to Thurso, operated on this occasion by 27588 (SN56 AXS), an integral ADL Enviro with B60F seating arrangement - yes, you guessed it, 3+2 seating. Obviously, if the alternative was for these services to cease operating if they couldn't be combined with school runs in the daytime peaks, having to contend with this rather cramped and particularly uncomfortable seating is a small price to pay for the ever-expanding network of local bus services in the area, which appears to have grown since Stagecoach came to town last year. 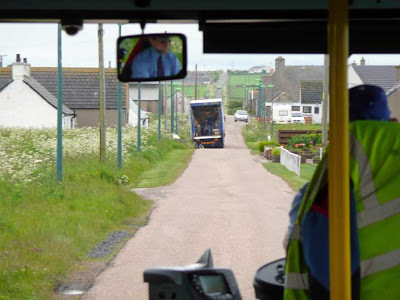 3+2 seating on this integral ADL Enviro300, seen here as we alight in central Thurso. Our stopwatch was started the second we pulled away - 2 minutes late at 1027hrs. We were scheduled to arrive at Land's End the following day at 1722hrs, totalling 30:57, but with our 2 minute late departure, could this be shaved to a mere 30:55? 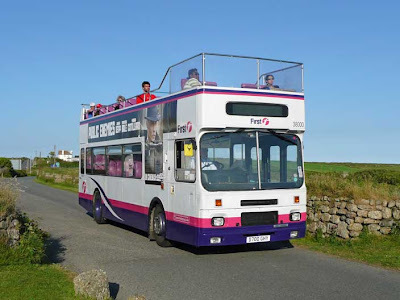 As with Service 77/77A, I've travelled on this route on three occasions now; this, the latest, offered the best views of Dunnet Head, the most northerly point of land on the mainland. 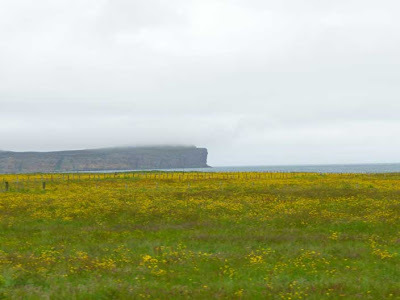 The bus passes through the tiny village of Dunnet but the road to the historic outcrop is a further couple of miles by road. You can't get any more northern than this - Dunnet Head, with a large dollop of cotton wool on top. Our journey did look as though it would run into trouble after only 15 minutes, as the photo below shows. Luckily, our Nottingham-born and bred driver (where are all the Scots drivers?) chose to do the only sensible thing with a trio of long-distance travellers on board, and that was to mount the ornamental grass verge to pass. Well done him! We were all impressed. We were a couple of minutes late arriving in Thurso, alighting on Sir George's Street at the time we should've arrived at the town's rail station, 1130. Not to worry though as our next journey wasn't until 1305hrs. Having visited the most northerly Tesco for supplies and following the wander to the 99p shop in the town centre that sells microwaves (sadly, not for 99p! ), we headed to the rail station in the drizzle. This stands at the top of Lovers Lane - at the foot of which is the town's bus depot. When I visited here last November, the Rapsons signs were still in evidence, now it's Stagecoach everywhere - except, weirdly, on the buses - some of which continue to only bare Rapsons fleetnames; others have both Stagecoach and Rapsons and others have just Stagecoach names (generally these are the ones in Stagecoach corporate swirls). Stagecoach's bus depot in Thurso. Until last November, Rapsons names still were shown on the sides of the buildings; they can still be seen on almost all the buses. I assured my companions that this particular train journey on the Far North Line would be very quiet indeed. We had seat reservations that accompanied our online advance ticket purchases, but I was confident they weren't really needed. How wrong I was! For on the platform, as our Class 158 approached, were over 25 people. On board - and the train had only called at Wick - virtually all seats were taken, including those we had reserved. 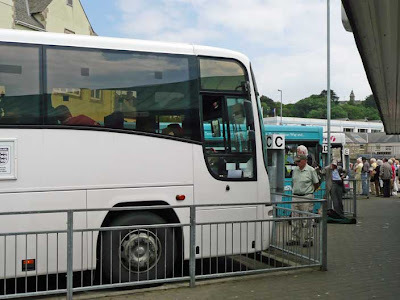 Shearings had booked a coach load of people onto the train from Wick to Golspie, for reasons unknown, and their driver had apparently told them to "sit in any reserved seat". What he should've said was "your seats are reserved and you can identify these over those that have been reserved for the other passengers as your surname has been written on your reservation slip". 158725 stands at Thurso station, just before the game of musical chairs inside. The conversation I had with a gaggle of over-60s as I asked them to move from our seats was just surreal. Asking politely had no effect; the guard seemed completely lacking in the areas required to marshall the situation, and so diplomacy was ignored as I virtually ordered them to move. It worked (take note United Nations!). Having realised I was legitimately invading their airspace, the people sat in our reserved seats buggered off somewhere else. The completely ludicrous logic of these people in sitting where they did still baffles me to this day. All that was needed was for the Shearings driver to have conveyed with much more accuracy what the situation was, and for the First ScotRail guard to ensure - prior to the train's departure from Wick - that the coach load were sat in their reserved seats that corresponded to their surnames, and none of this unpleasantness would've happened. As ever, it was down to the little people to sort out - successfully. Rant over and we were now aboard 158725 and from what you've read above, our Plan B to sit in first class legitimately (there is no first-class fare on the Far North Line, thus occupying first class is perfectly okay) was scuppered as it was full of yet more Shearings people. However, it was a very nice, scenic trip (that got a lot better after Golspie!) and didn't seem to drag on as long as it has done in the past when m'colleague and I made two trips along the route during our 2005 LEYTR Railrover. Neither of the two I was travelling with had been on the Far North Line before and the journey certainly represented a box ticked for them. On reflection though, I'd still prefer to travel between Wick/Thurso and Inverness by coach over train; the fare is cheaper and the journey time is quicker. Both offer equally dramatic scenery though completely different sorts. You see a lot more of the sea by road and more of the fascinating villages en route. Inverness was our tightest connection of the entire jaunt: 5 minutes. We were due in at 1648 and out on a connecting Class 170 'Turbostar' at 1653, or so we thought. The dashing around wasn't really needed as the 1653hrs First ScotRail departure was actually timed at 1656. Yet again people were sat in our reserved seats, though a mild pleasantry got them to shift on this occasion. We departed on time with a heavy load aboard 170394 and made good progress along the Highland Main Line, south to Edinburgh. It's not far south of Inverness that a lengthy 1:60 climb is undertaken for quite some time to reach the highest point a railway on the National Rail network - just over 1,500 feet at Drumochter Pass. Compared to the '158' we'd just been on, this '170' was much gutsier and handled the steep inclines very well. The comfort was excellent, though the air conditioning poor. 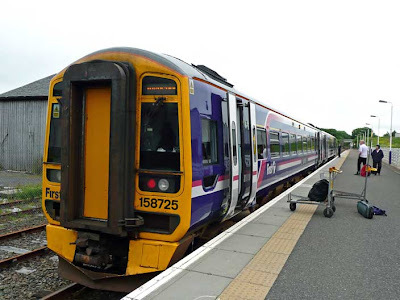 First ScotRail's trains travelling south of Inverness along this route do so to either Glasgow or Edinburgh. The journeys bifurcate at Perth and it was here, on our Edinburgh-bound train, that Glasgow passengers had to change. This saw the load reduced somewhat, as we headed off to the Fife coastline at Markinch, and south through Kirkcaldy and over the Forth Rail Bridge and finally onto Edinburgh. It's always a fascinating experience, crossing the Firth of Forth by rail. I remember asking my comrades how long it'd take to complete painting the bridge; none of them fell into the trap I was expecting them to as the both read this blog! There wasn't complete carnage on the streets of central Edinburgh as we'd been told to brace ourselves for, what with the building of the city's tram network. It was decidedly calm along Princes Street. We'd arrived at 2029hrs as booked and the city centre was dying down, so perhaps that's why things seemed so calm. To my regret and - soon after - eternal shame, I found myself in the queue at a McDonalds, purchasing a perfectly-formed tiny burger in an equally tiny and perfectly-formed sesame seed bun. From the fast-food establishment (that's curiously started painting all its outlets a organic green colour - we weren't fooled!) it was only a couple of minutes to the city's bus and coach station. It was from here that we were booked on the UK's longest coach service - National Express' Service 336, linking Edinburgh with Penzance daily. The service has been operated by First Devon & Cornwall for many years (possibly by Wessex before that) and it was a fortnight ago that I learned the company had been unsuccessful in the latest round of tenders, losing 5 contracts from its bases at Camborne and Penzance - the 336 is one such contract, passing to Bruces Coaches. We didn't know any of this at the time and at 2115hrs boarded an all-white Volvo B12M/Plaxton Paragon C49Ft in readiness for our 2130hrs departure. The vehicle, despite its lack of livery, was a First-owned vehicle and had operated NX services since new. 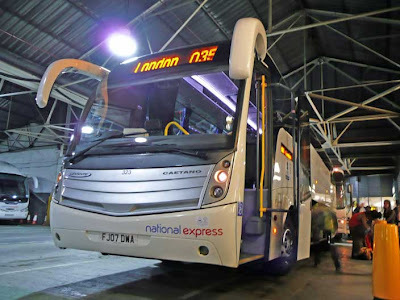 It carried contravision boards on both sides - in the slots were signs stating 'National Express', though I assume equally easy could they show 'First', should the vehicle be needed for their own work. Specifically, our steed for next 18.5 hours was 20532 (WV52 HVF). Day 3 draws to a close here in Glasgow, where we take our last proper break until around 4pm the following day when we arrive in Penzance. Despite its high mileage, she was in pretty good shape. The acceleration from a standstill was as good as any modern, i-shift-fitted Volvo, and the small steering wheel found in this vehicle type seemed to assist the drivers in the vehicle's overall manoeuvrability. While the coach seemed in good mechanical condition, the leg room for such a lengthy journey was very poor indeed. Compare this shot with the one I took while aboard Bruces Coaches' tri-axle Scania/Levante. We left the action in Part 3 somewhere not too far south of Glasgow when midnight struck. We called in at Hamilton and then Carlisle and then down towards Preston and Manchester. We had a particularly early first 'comfort stop', at Southwaite Services. We arrived at 0105 and were told to be back after 30 minutes. To our astonishment, our drivers, Eddie and Mark, just bailed out, leaving the engine running, all interior and exterior lights on and their personal possessions in full view. Wow. They must have been hungry. Their announcements were very accurate and included some interesting phrases I've never heard made before over public address systems in coaches. My favourite was "We expect you as individuals to...." generally followed by ".... be back on board at the time we state". Back to the longest scheduled coach journey in the UK, and following our departure from Southwaite Services I remember falling asleep, with Preston being a very hazy blur. We omitted Salford University and despite a seemingly excellent run, were 10 minutes late by Manchester Central and even more at Manchester Airport! Quite a few alighted here, showing how useful the service is for those wanting to catch the first flights of the day from here. We then we operated to Keele Services for our second 'comfort stop'. We all quipped that two nights earlier, we had our first 'comfort stop' of the jaunt on the tarmac on the other side of the M6 heading north aboard the tri-axle Scania/Levante bound for Inverness. Again, both drivers just disappeared - they were always the first off the coach - and returned seconds before our departure. 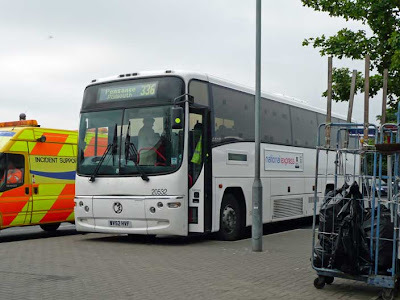 On each occasion they undertook a head count to ensure they weren't going to leave anyone behind, but I found it fascinating how the vehicle was only ever turned off in bus/coach stations, even if it was for a minute and yet kept running at motorway service areas for thirty minutes or so. Birmingham Central was the half-way point and I think it's fair to say that we were all feeling rather chipper, despite it being 0645. Dawn was breaking and the daylight is a natural tonic to the overnight traveller. Another 'comfort stop' at Strensham Services was on the cards en route to Bristol, where yet again Eddie and Mark were the first off and last back on. By now traffic was building and the service stations were becoming progressively busier. You could be forgiven for thinking that by Bristol, you're almost there. I mean, they all speak like they're from Cornwall round there, don't they? You'd be wrong. We arrived in Bristol at 0910 and yet it would be another 6:50 before we reached Penzance. If you're not averse with the West Country, it takes ages to travel anywhere on account of the lack of motorways there. Our coach also operated through all the towns, cities and other tourist areas, additionally increasing the journey time. When m'colleague undertook the 336 service a few years ago, he said that by Bristol he seriously contemplated leaving the service early, such was his boredom. We were a little fed up though the scenery was changing and I think we were all looking forward to completing the main element of the jaunt later on this afternoon. From Bristol we travelled through Taunton to Exeter, where we had another short break, then onto Plymouth and then Truro though a whole host of smaller localities en route. We hardly deviated off the main roads though. Truro seemed like the nicest place along this section of route. As we were backing-off the stand in said town, a First driver heading northbound told our crew that there'd been a bad accident at Redruth and to go a different way. This we did but the traffic was awful. It got worse in Camborne, by which time we were over 20 minutes late. Our drivers left us here and were relieved by a solitary chap who took us forward to Penzance via St. Ives. 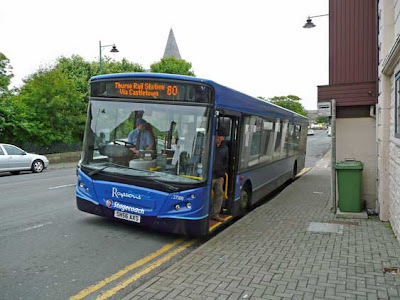 The bus station in St. Ives will certainly test Bruces Coaches' drivers if they're to use tri-axle Scanias on the 336 when they take over operation of the service soon! I'd never been to St. Ives before and did a mini 'double-take' at the three-point turn required on a cliff edge to negotiate the bus station. So many questions: "How safe *really* is this manoeuvre?" "What happens if a car is parked here, the owner nowhere to be seen?" "What if another bus is making use of the bus station?" Whether it was divine intervention or not, we had an empty bus station and a clear approach so we had no accessibility issues. We were still at least 20 minutes late though. It was clear by now that this would have an effect on our journey time. We had planned an end-to-end time of 30:57, but thanks the our driver from John o' Groats to Thurso leaving 2 minutes late, could shave this to 30:55. Unfortunately this would not be attainable now as we had planned to catch the 1630 First Devon & Cornwall Service 1 to Land's End. We planned for the worst and assumed we'd not arrive for that time. As it turns out we arrived at 1632, having completed 19 hours and 2 minutes aboard Service 336. We'd done it though. Tomorrow would see us undertake a trip aboard the UK's lengthiest bus service in terms of end-to-end journey time. We were getting quite a taste for this sort of thing! The odometer of the coach now read 443,454km, meaning we'd travelled *precisely* 1,036km or 681.02 miles. Beat that! Though taking 19 hours and 2 minutes, our average speed was a very disappointing 35.8mph. Still it's more civilised than walking the distance as some people do! Precisely 681.02 miles after we left Edinburgh we arrive at Penzance - 32 minutes late. With our arrival being at the time it was, the 1630 bus to Land's End had gone. We chose to visit the b+b we'd booked to dump our things and make for the next departure at 1740, Service 1A. This duly arrived in the form of First Devon & Cornwall's 34753 (A753 VAF), a Leyland Olympian/ECW, new to Western National in 1983. What a beast! Quite different to the coach we'd called home since last night! It was dirty, looked and sounded rough and gave an outrageous ride, but what a ride! "It was held together by the rust mites holding hands", but what a ride - First's Service 1A to Land's End is thoroughly recommended!! The scenery as you climb out of Penzance is excellent. The narrow roads, the overhanging trees, the hairpins and the awkwardness as you meet a similar vehicle coming the other way can only be very stressful for the drivers of this route, but superb for the traveller. I've never been to Land's End before - and Penzance only once during our 2005 LEYTR Railrover - so this was quite a surprise. It was a route sure to wake up any sleepy traveller. A good example of what we encountered aboard Service 1A - this 1:7 gradient with a blind, single-track bend. Unfortunately, travelling into the sun prevented me from taking photos of the hair-pin bend, even narrower roads and a tricky situation when we met another bus heading in the opposite direction. We arrived at Land's End precisely at 1832 hours, when the stopwatch was stopped. We'd done John o' Groats to Land's End in exactly 32:05, precisely 1:08 longer than we'd planned. It was an excellent journey though, we all thoroughly enjoyed it. We arrived a little too late to have a similar photo taken to that we'd posed for at John o' Groats just over 32 hours ago. That was something else we were all suffering with: we'd mention something we'd done during the jaunt but we'd spend ages contemplating whether this thing had occurred either today, yesterday, Sunday or Saturday. You lose all concept of time undertaking this type of trip. Our last journey of the day was aboard First Devon & Cornwall's Service 300, an open-top service, returning via an almost-identical route to that we'd travelled on from Penzance. Our chariot was 38000 (D700 GHY), a Volvo B10M Citybus/Alexander RV, new to Badgerline in 1987. It handled the hills and the hairpin better than our outward Leyland Olympian! And that was it. The summer's evening and view across the bay couldn't have been better as we tucked into fish 'n' chips and then a drink or two in Wetherspoon's most southerly freehouse, The Tremenheere. 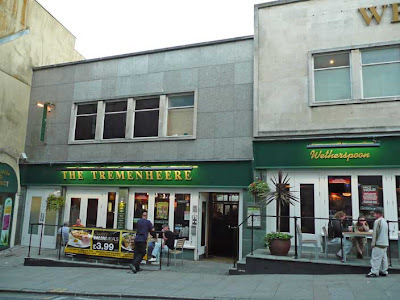 The Tremenheere is to Land's End what The Alexander Bain is to John o' Groats. Cheers!! We left the action at the end of Day 4, successfully arriving at Land's End, having completed the main segment of the trip in 32:05 precisely. It was now time for home, but we opted to travel to London taking in England's longest bus service. 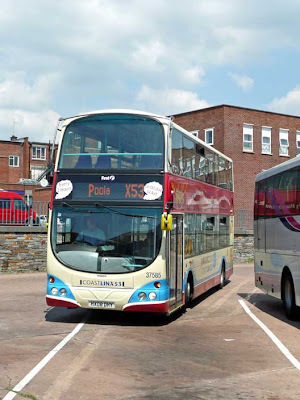 We'd bagged its coach equivalent yesterday, and so it felt only right to dream up an itinerary that encompassed First's Jurassic Coast Service X53, that links Exeter with Poole in 4:40, or 280 minutes. It's the lengthiest bus route in terms of its end-to-end journey time, though it is pipped to the post when compared with Stagecoach's Service X5 for mileage covered. We had an enjoyable breakfast at the b+b in Penzance town centre, where we resided overnight, and jumped aboard the 0717 First Great Western train service bound for London Paddington, though we were to alight at Exeter. The last time I'd departed from Penzance by train was during the 2005 LEYTR Railrover and today I got one of my travelling companions to replicate a photo of me in the same spot as that which m'colleague had done in 2005, and comparing the two now, I'm pleased to report I've lost weight (and a little hair!). FGW's 43094 leads our Penzance-London formation, seen here as we alighted at Exeter St. David. I think First's train livery really suits its Class 43 High-Speed Trains (HSTs), in fact, the livery suits all EMU, DMUs and locos I've seen wearing it. It's not too in-your-face as the Stagecoach variant for its HSTs is, and the bright pink pulse lines contrast well with the deep blue. The journey from Penzance to Exeter is no walk-in-the-park. It's not just down the road, as the uninitiated Cornish and Devonian traveller would assume. The journey time was 3:16, with our arrival in Exeter St. David being at 1054hrs. The journey is also particularly spectacular, with very impressive views from the edge of the Cornish coastline and the very picturesque Dawlish Sea Wall within Devon. There aren't many main rail lines permitting frequent HST-hauled trains that see the route used hug to the coastline as much as this one. 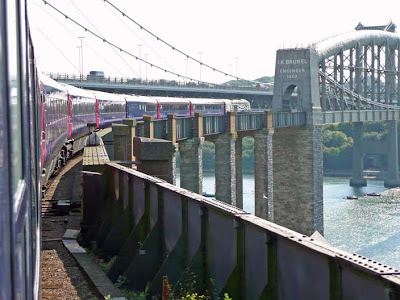 Then, no sooner have you left the seemingly innocuous station of Saltash, it's time to grab your camera and lean out of one of the windows for one of the most impressive shots that can be taken on our national rail network - crossing the Royal Albert Bridge into Plymouth. The Royal Albert Bridge - now 150 years old. Our HST curves to enter the bridge heading east from Saltash towards Plymouth. The month previous, the bridge had celebrated its 150th anniversary. 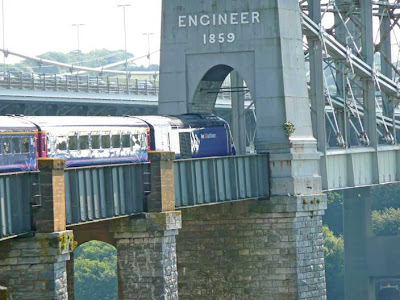 Built by Isambard Kingdom Brunel in 1859, the bridge is regarded as one of the most spectacular in the world. 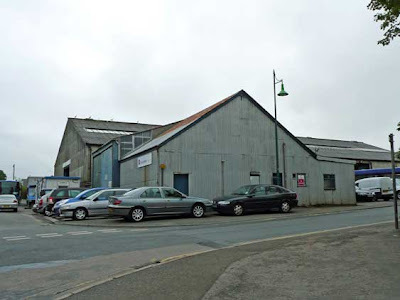 Its unique design makes it immediately recognisable and it is undoubtedly the gateway to Cornwall. It has its own webcam (click here), too. We were lucky to be ensconced in the Quiet Coach at the very rear of the train and so were able to capture the rake of Mk3s curving towards the portal. It's one of my favourite shots and I even managed a little bit of video recording thanks to my digital camera. Today was the start of the mini heat-wave that ended June and kicked-off July and it was getting very warm indeed. The air conditioning aboard the HST was very good. 43094 was at the front of our eight-car formation, with 43012 at the rear. 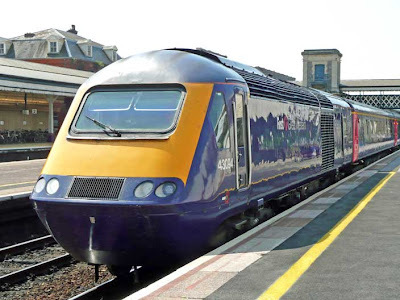 As they glided our train out of Exeter St. David, I must say I was a little disappointed at how un-intercity-like the new MTU41 engines fitted to virtually all HSTs make them sound. 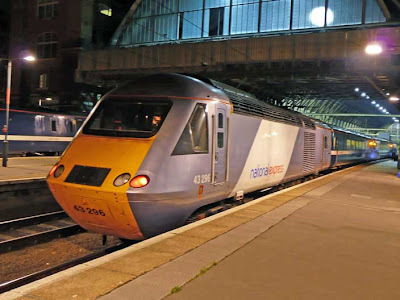 Time was - not too long ago - when standing on the platform as an HST departed actually made you deaf for a spilt second as rear locomotive screamed out the station. That was when their motive power was supplied by their original Valenta engines; all but those operated by Grand Central and Network Rail's test trains have the new MTUs installed, which are lacklustre by comparison. The walk up hill to Exeter city centre was no joke. It was becoming very hot indeed and we were all heavily laden with our ruck sacks. Once we'd reached the Snowdon-like summit, we went straight to a 'greasy spoon' cafe for sustenance. I found a particularly good vantage point for photographs outside and was impressed at the turnout of the Stagecoach vehicles here. With 20 minutes or so to go before our next epic journey was due to commence, we wandered to the bus station where we were greeted with a queue at our stand of about 80 people. "We could have problems here" I remembered thinking to myself. Upon further inspection, there were a lot of young people with luggage in the queue and I didn't expect the X53 to attract that kind of clientele. I'd expected a fairly long queue of people with blue rinses and no intention of paying. 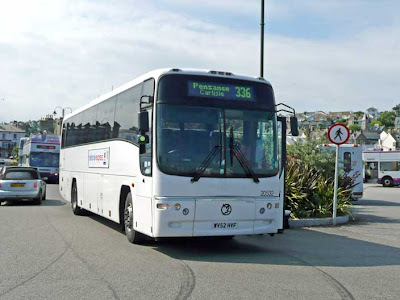 I was right, after the 15-meter-long Trathens Volvo B12T and its traditional 12-meter duplicate had taken all those dwelling at our bus stop to London, with the exception of we three fare payers, the rest were of retirement age. The fare aboard the X53 was excellent value - £6, which also doubled-up as a rover ticket for all First services in the area. 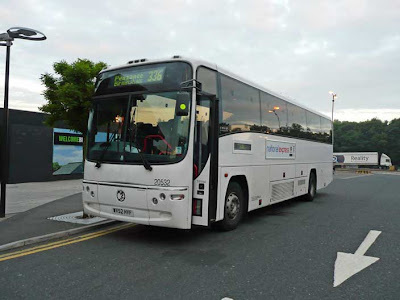 Our vehicle was 37585 (HX08 DHY), one of the nearly-new Volvo B9TL/Wright Eclipse Geminis. Here is one of seven similar 58-reg Volvo B9TLs with Wright Eclipse Gemini bodies that work England's longest bus route. 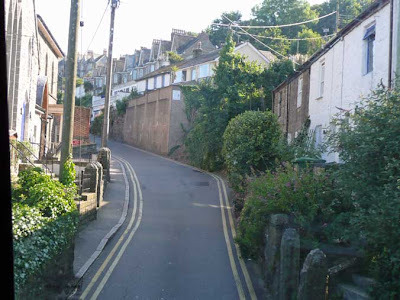 We departed Exeter virtually on time and made our way along the trunk routes - passing though the wonderfully named village of Beer - before heading off the beaten track down narrow roads with steep gradients (it started to remind me of the Penzance-Land's End route) to Seaton. We clung to the coast more now, travelling through Lyme Regis, Bridport and eventually we spotted Portland Bill on the horizon. It wasn't too much longer after this that we dropped down into Weymouth. A couple of years ago, m'colleague and I visited this town to attend a bus rally therein. 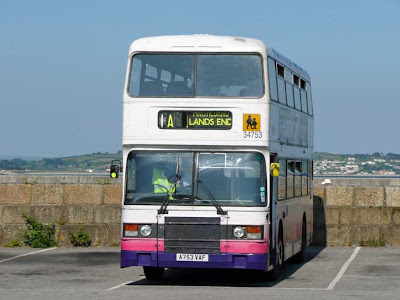 We made numerous journeys in the area aboard some of the historic buses and coaches that were providing free rides - my favourite was aboard a Mk1 Leyland National to Portland Bill itself. I'd grown up travelling on these vehicles and I was one of the only ones volunteering to travel on this over more historic half-cabs on the same run. It was an excellent - if hectic - day. Today saw an equally hectic seafront at Weymouth; there were buses galore, mixed in with all the traffic. Fairly generous timings are given to the X53 at its easterly end, and I could now see why. We had our solitary driver changeover in Weymouth, just before reaching the sea front, and then it was off to Poole via Wareham. Traffic into Poole was particularly bad and we lost a good 15 minutes, not arriving until 1740 - almost 5 hours since we'd boarded. One of our party, who had an early start back at work the following day, bailed out at Poole rail station and caught a much faster (and expensive) train to central London. Those of us remaining 'til the death, spent just over an hour in Poole before catching the last London-bound National Express coach departure of the day at 1900. Service 035 is operated by Transdev Yellow Buses (Bournemouth Transport) on behalf of NX and they have a couple of different vehicle types. We travelled on 323 (FJ07 DWA), a Volvo B12B/Caetano Levante with seemingly inoperable climate control. Boy did it get uncomfortable travelling the extended route to London via Portsmouth! We had a full load by the latter and even sleeping was becoming an arduous task, what with the beads of sweat being produced by my and my fellow passengers' bodies. It got very warm aboard this coach until the driver finally managed to get the climate control working less than an hour before the end of our 3:20 journey. Then suddenly our mute driver (no announcement of any sort) seemed to jump into life and had a fiddle and the climate control started to work. Why hadn't he done this while waiting his departure time at Poole? He was not partitioned from the rest of the saloon, so was sat in his own juices like the rest of us! It was a very poor journey if I'm honest - an opinion shared by the remaining 'Top 'n' Tailer' sat next to me. We were both glad to be off the coach once we'd entered London Victoria Coach Station Arrivals, a few minutes before our scheduled arrival time of 2220. Was it really from this coach station that 4 days earlier - almost to-the-hour, we'd left bound for Inverness? It seemed like a lifetime ago, while at the same time only yesterday! We caught a Tube to King's Cross - a very desolate Tube! - and boarded with plenty of time the last National Express East Coast departure of the day, the 2330 to Leeds, dropping off only at all its stops en route - the first of which being Peterborough at 0023. The train was formed of 43296 (leading) with 43313 at the rear. This was to be our last journey that forms part of the LEYTR Top 'n' Tail. What a trip!! Now technically in Day 6, we'd arranged a lift from Peterborough station back to Lincoln, from where the jaunt had started. It wasn't until much later on the sixth day that I finally made my own way home. We've not mentioned in depth is the costs incurred. We said from the start that this jaunt would befit the current economic climate and we believe we conformed superbly. We spent two overnight stays in b+bs (Wick & Edinburgh), totalling £52.50 and each incurred only £32.65 in bus, coach and rail fares. 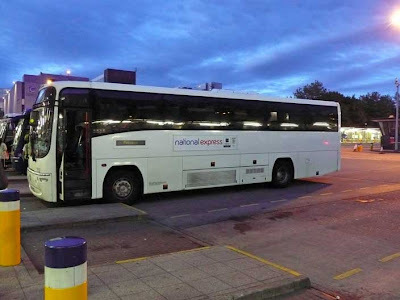 This latter figure was so low because the National Express coach journeys were free of charge for us since we ran our idea by the now stricken company, who were more than happy to permit us travel for free as they rather enjoy our blog! How about 3 days Bushcraft on a canoe?